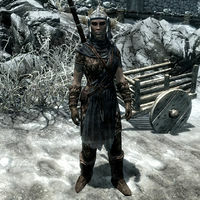 Stormcloak Guards are guards that can be found in Markarth, Solitude, Morthal, Falkreath and Whiterun when the Stormcloaks take over their respective Hold and they act as the military and police force throughout that Hold. 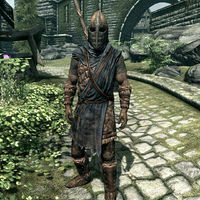 Each guard wears a set of Stormcloak armor, a helm (either Stormcloak, hide or scaled), fur gauntlets, fur boots and a steel (or hide) shield. Their melee weapon ranges from one that is iron and one-handed to one that is steel and two-handed. They have a hunting bow, a random number from ten to twenty steel arrows and a steel dagger. They all carry a set of common clothes. In addition they may carry from none to all of the following: a torch, a food item, a small amount of gold, and an extra helm. Their primary skills are one-handed, two-handed, archery and block. Their secondary skills are heavy armor and light armor. The guard pictured can be found at Stonehills when the Stormcloaks take over Hjaalmarch. These Stormcloak Guards are guards that can be found in Solitude when the Stormcloaks take over Haafingar. This page was last modified on 9 March 2018, at 02:57.